LOS ANGELES, California, November 22, 2013 (ENS) – The Honda Accord has been chosen as the Green Car of the Year® 2014, but this year the award goes not to just one model but three: the Accord, Accord Hybrid, and Accord Plug-In Hybrid. “Green Car Journal,” which has sponsored these awards every year since 2005, announced the winner on Thursday from the floor of the Los Angeles Auto Show, to an audience of thousands of international journalists and industry VIPs. 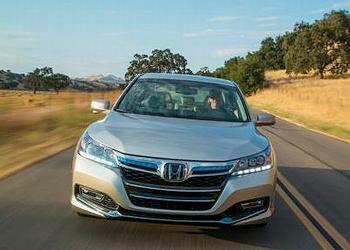 “Honda’s 2014 Accord clearly leads by example in the ‘green’ space and is a deserving winner of the 2014 Green Car of the Year honor,” said Ron Cogan, editor and publisher of the Green Car Journal and CarsOfChange.com. In the Green Car of the Year program, “Green Car Journal” editors identify five finalists after an extensive vetting process. The winner is selected by a majority vote of the Green Car of the Year jury. The Accord was chosen from among a field of five finalists, including the Audi A6 TDI, BMW 328d, Mazda3, and Toyota Corolla. No electric cars made the cut this year. Jurors include leaders of influential environmental and energy efficiency organizations, such as Jean-Michel Cousteau of the famous oceaneering Cousteau family, who is now president of Ocean Futures Society. Cousteau has served as a Green Car of the Year juror since the award’s inception. “When you consider the Honda Accord’s cost and the mileage it delivers with standard and hybrid power, you’re not only economically ahead of the game but also improving environmental impact by using less petroleum and cutting CO2 emissions,” said Cousteau. Auto enthusiast and Tonight Show host Jay Leno is on the jury as are: Kateri Callahan, president of the Alliance to Save Energy; Matt Petersen, board member of Global Green USA; Frances Beinecke, president of the Natural Resources Defense Council; and Dr. Alan Lloyd, president of the International Council on Clean Transportation and former head of the California Air Resources Board and the California Environmental Protection Agency. The 2014 Honda Accord that runs on gasoline gets 47 miles per gallon in city driving and 46 on the highway, one of the most fuel-efficient cars ever made. The Accord Hybrid gets 50 highway mpg and the Accord Plug-In hybrid gets 115 miles per gallon equivalent, the highest of any mid-size hybrid sedan in the United States. It’s been a good week for Honda at the LA Auto Show, which opens to the public today and runs through December 1 at the Los Angeles Coliseum. 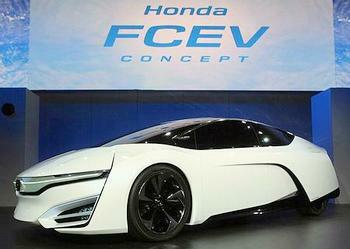 Honda’s new fuel cell electric concept vehicle made its world debut there on Wednesday at the show’s opening Press Day. Representing Honda’s next generation fuel cell vehicle, the ultra-aerodynamic car is scheduled to launch in the United States and Japan in 2015, and in Europe a little later, Tetsuo Iwamura, president and CEO of American Honda Motor Co., announced at the show. “Today, we want to focus on what we believe has the potential to become the ultimate solution to realizing ultra-low carbon mobility – and that is the fuel cell electric vehicle,” Iwamura said as he revealed the FCEV Concept. Iwamura said the company is “targeting a significant reduction in cost” to remove one barrier to the widespread adoption of fuel cell vehicles, although he gave no firm price. The new FCEV has the world’s first application of a fuel cell powertrain carried entirely within the engine compartment of the vehicle. This allows for efficiencies in cabin space for the five-seater and permits application of fuel cell technology to other vehicle types such as SUVs and light-duty trucks. The Honda FCX was the world’s first production fuelcell vehicle, introduced to the United States and Japan in December 2002. It became the first fuel cell vehicle certified by the U.S. EPA and the California Air Resources Board. Since then Honda has deployed other fuel cell vehicles in the United States and Japan, including the FCX Clarity, which was named Greear of the Year in 2009.